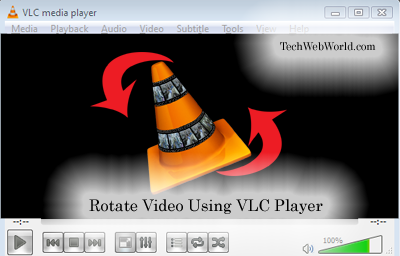 So, you are one them who are looking for guidance to Rotate a video?, If YES then you’re arrived just in the right place because in this post we will be showing you an easy and step-by-step guide on How to use vlc player to rotate a video. It happens sometimes that you’ve a video which is rotated with a degree of ninety(or any other which is wrong), so in that case you need to rotate the video in the right degree to let you be able to watch the video without any hesitation. An example of why you should need to rotate a video is, suppose you just captured a video on your mobile phone but the video recorded is in wrong dimension/degree. In this case, the major and my favourite media player can be employed for rotating a video. It is very easy to rotate a video using vlc media player, what you’ve to do is to read the following steps carefully and do the same as I’m discussing. Step-1: First of all, open the video with vlc media player which you want to rotate. Step-2: Now from the Menu Bar, right click on “Tools” and select “Effects and filters”. 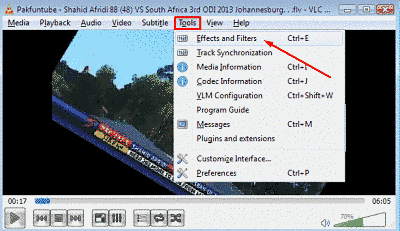 Step-3: A new window will pop-up named “Adjustments and effects”, In this window switch to second tab named “Video Effects”. 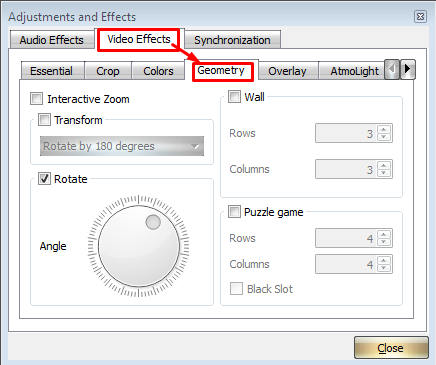 Step-4: Now switch to “Geometry” tab. Now get ready to rotate your video! Step-5: Here we will work on the Rotate section present at the left bottom. (see screenshot). So first make a tick mark on the box in front of rotate to enable rotation and look at the angle rotation circle. To rotate the video, you’ve to hold right-mouse on the rotation point in the circle and move it clock or anti-clockwise. Keep hold and move the mouse until you get the video rotated in a satisfactory degree. 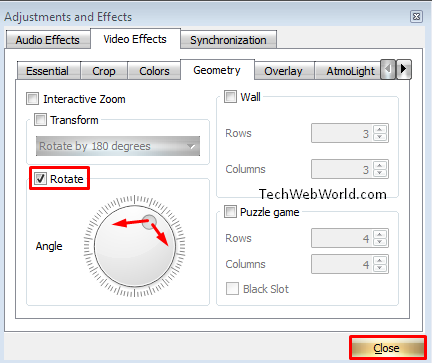 Once you got the video in the right degree, stop moving the rotation point anymore and click on CLOSE button. So this was the process of rotating a video in vlc media player that you learned above, now if you want to save the rotated video to your computer in order to play it later on any other player then look at the below steps. To save the video you rotated with vlc player, follow the below steps. Step-2: Now, at the left side, scroll down and expand “Stream Output” and then expand “Sout Stream” by clicking on down-arrow at front of it. Then scroll down to “Transcode” and click on it. Step-3: Now look at the right panel, scroll down and check the box of “Video Transformation” filter under video filter. Now click on save button and look further. Step-4: Click on “Media” >> “Convert / Save. Now click on Add… button and select the rotated video. Step-5: Now click on convert/save button and in the next window, click on browse and select the destination where you want to save the rotated video, give it a name. Then finally click on START button so the streaming will start on vlc media player which will take some time (depends on file size) and you get your rotated video at the destination folder you specified. Thus, this was a step-by-step guide on how can i use vlc to rotate video. I hope you liked our post and it helped you. In case of facing any problem using the above method feel free to leave a comment. We will be surely reply to your comment ASAP with the solution. NOTE: After rotating a video, you may see all videos rotated in that degree on VLC which can be solved by selecting ‘Preferences’ under ‘tools’ and then clicking on “Reset preferences” button at the left bottom of the new window. We appreciate comments on this post. If you are facing any problen while using vlc player for rotating a video, feel free to leave a comment. We will try to help & solve your problem!